Zhu does not disappoint. 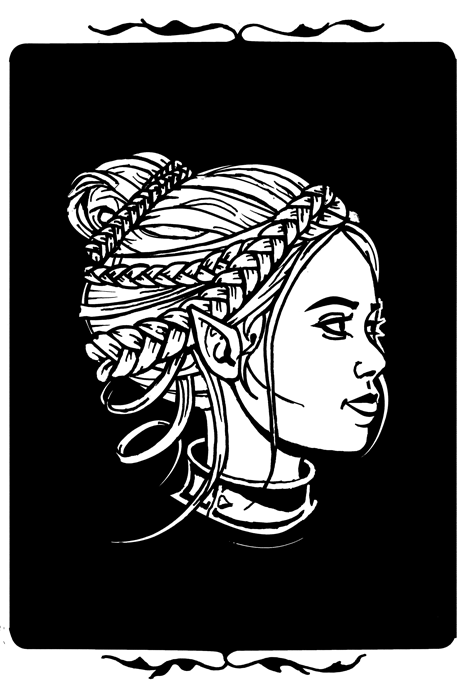 As well as many posts on gamebooks, Fighting Fantasy and a Fighting Fantasy collection list, Zhu has an art page and many other interesting posts including some great ones on female armour. > What was the first gamebook you read? Deathtrap Dungeon. I remember it clearly - I played through with my dad (I think he was checking it was suitable reading) and he encouraged me to cheat at the end! > What is your favourite gamebook? The Sorcery! 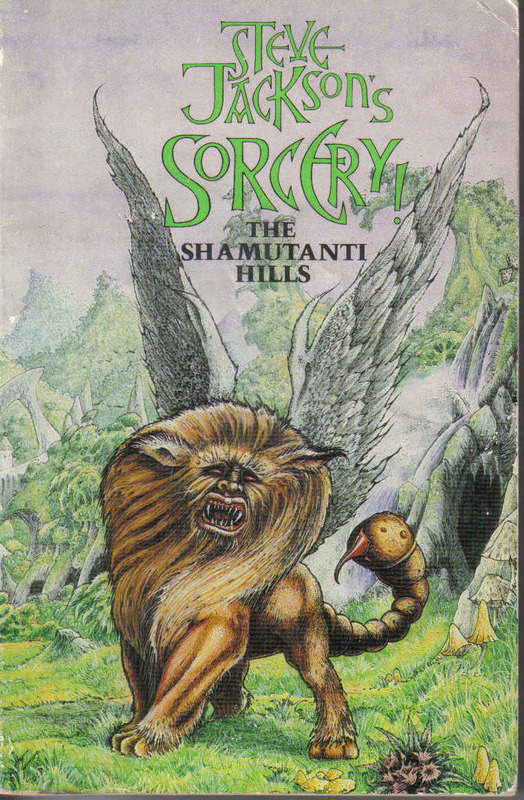 series by Steve Jackson is the one that comes to mind, awesome adventure, awesome art. I suppose it's not really fair to choose 5 books (including the Spellbook) instead of one, but there you go! It's got to be Warlock of Firetop Mountain. 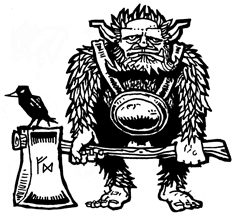 We all know Ian gets a bit of stick from gamebook fans for his "gonzo" adventure design, but there was a more wild and creative streak in early D&D games, and I think Steve and Ian captured that perfectly. It also serves as a great introduction to the form - all the important elements are there. Having said that, if I knew someone who was perhaps 10-16, heavily into console gaming or MMOs and didn't read much, then I'd give them a copy of Destiny Quest by Michael J. Ward. > Summarise what a gamebook is to a newcomer in 100 characters or fewer. Only YOU can decide what happens through a multiple choice narrative structure. 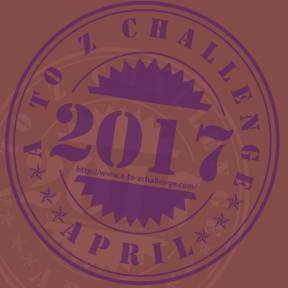 > What do you think the future of gamebooks is? Well, I think were getting into the whole "death of print" all entertainment media is becoming digital, except for the luxury market - thinking of Fantasy Flight Games boardgames or even Games Workshop products - hugely expensive and very tactile, with super-high-quality components. I don't think the luxury item is a route that gamebooks are going to go down (although they could), so they're going to become digital assets. With the plethora of devices that do not have decent keyboard input, we could see the gamebook as software format become the Interactive Fiction of the 2010s - with publishers making reasonably priced entertainment software that doesn't take a team of 300 people to make it - just one or two. I'd like to see the death of the amateur / professional divide especially in the FF scene. Just look what print-on-demand has done to the RPG scene, there are hundreds of micro-publishers all of varying qualities - but all with something to offer. And then Warlock magazine used to publish fan-submitted (rather than commissioned) adventures, so it's not a new idea. So I hope that Print On Demand enables a lot more semi-pro efforts. > Why are gamebooks great compared to games or books? As a literary form, game books are very different to a novel. When I think of the best genre works (Earthsea, Lord of the Rings) they have a narrative point, a sense of direction. When I think of my favourite gamebooks, they have a sense of an open 'anything can happen' exploration. Gamebooks tend to be the creation of only one or two people - and in many ways are more immediate and personal than the design by committee feel that the average video-game has. > Have you written any gamebooks? I wrote one when I was 11 or 12. It was a kind of dungeon-crawl set on board a derelict alien spaceship, with laser guns and dog headed humanoid aliens. I don't think I ever finished it. 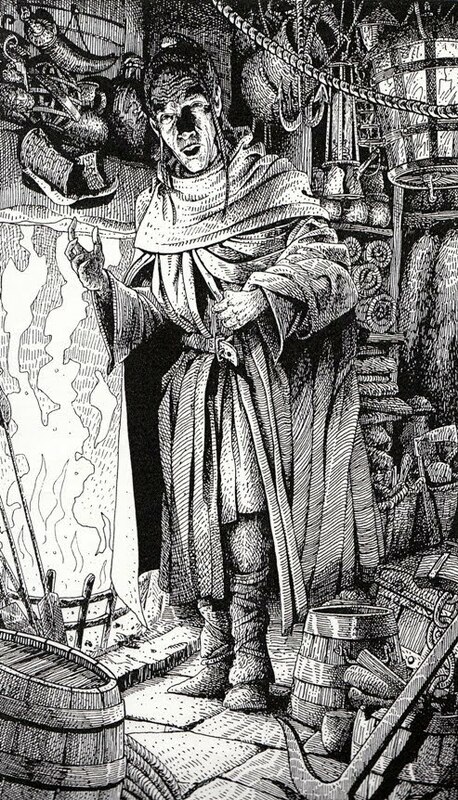 > Who is your favourite gamebook illustrator? Nicholson... Blanche... McCaig... Chalk! Nicholson just has an amazing grasp of technique and style, characterful, whimsical, slightly grubby and mysterious. I almost cut Blanche off the list having recently seen the work he did on The Glade of Dreams, absolutely dreadful, we all have off days and Sorcery! is sustained brilliance, so he's forgiven. Chalks run on Lone Wolf is also uniformly great. McCaig and Deathtrap Dungeon - it's just the sheer effort that McCaig has put into the textures and effects and history of every scene. > What process do you go through when coming up with a drawing? Sometimes an image starts with an extremely convoluted back-story that 'explains' in a narrative or historical way why things are like they are, and sometimes they start with a visual idea, an atmosphere or and then ends up with an extremely convoluted back-story added on to it to 'explain' it. I'll gather research materials - architectural reference, photos of people, animals, historical arms and armour etc. Then I start with small pencil sketches getting the composition and elements right, then I draw it up a bit bigger (about 1/3rd) than the final drawing, then once that's done, out come the pens and the thing gets inked. Then the image is scanned into Photoshop and the whole thing contrast adjusted - I work in black and white, not greys - Its important to me to try and evoke the feel of earlier print production methods, when everything was done off repro-cameras and tone / greys couldn't be consistently reproduced so weren't. Occasionally I fix up some bad scanning in and even rarer I'll rework something a bit in photoshop - I even created custom brushes based on the fiber-tip pens I use so that the digital work is as seamless as possible the analogue, but not much. Then it's shrunk down to print size and the final thing done! > particular creatures or scenes? Yeah, pseudo-medieval fantasy stuff, Tolkien, D&D or classic Fighting Fantasy type subjects. I'm drawn to humanoid monsters as a theme, they're us, but bad! So Orcs, goblins, hobgoblins, ogres, bugbears. > What is your favourite piece of art? Art? Mark Rothko's Seagram Murals. Illustration? 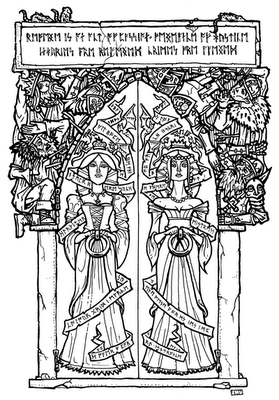 The Kelmscot Press Morte D'Arthur, Beardsley and Morris. Genre based ? Gary Chalks Talisman. > How do you practice your drawing to make it the best it can be? Well, I try my best, and it continually surprises and delights me that people actually like what I'm doing. I draw every day, sometimes not more than a quick sketch - a mix of experimentation and observational drawing, I do spend time just looking at things and people. My work is heavily stylised, some pieces more than others, so it's not always obvious the research that has gone into something! Looking at the work of the masters to see how they solved certain problems - Beardsley and Durer especially helps. > Do you have any other sites besides your blogs/Twitter feeds? Hmm. Well, yes and no! Zhu runs realmofzhu.blogspot.com and twitter.com/ZhuBajiee - although I tend to read more on twitter than post things. 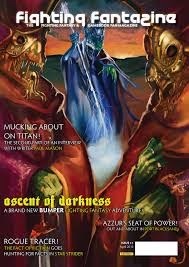 I also help Trevor Hammond out with his blog at http://pitfiend.blogspot.co.uk/ his work from Warlock magazine should be familiar to gamebook fans. There are some other bits here and there, like Owlandweasel.blogspot.com- which is a monster feed of people who used to contribute to White Dwarf in the 80s and are now active online - really quite interesting, but a bit of a mess!